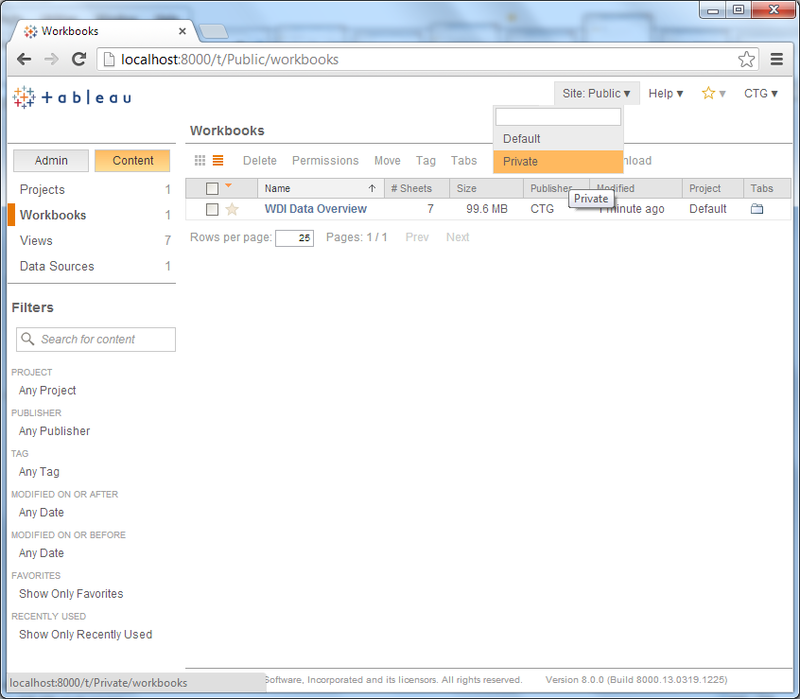 Tableau Server's sites are very handy for firewalling content. Judiciously used they make it much easier to isolate content so that only those users explicitly connected to the content's site can possible access it. 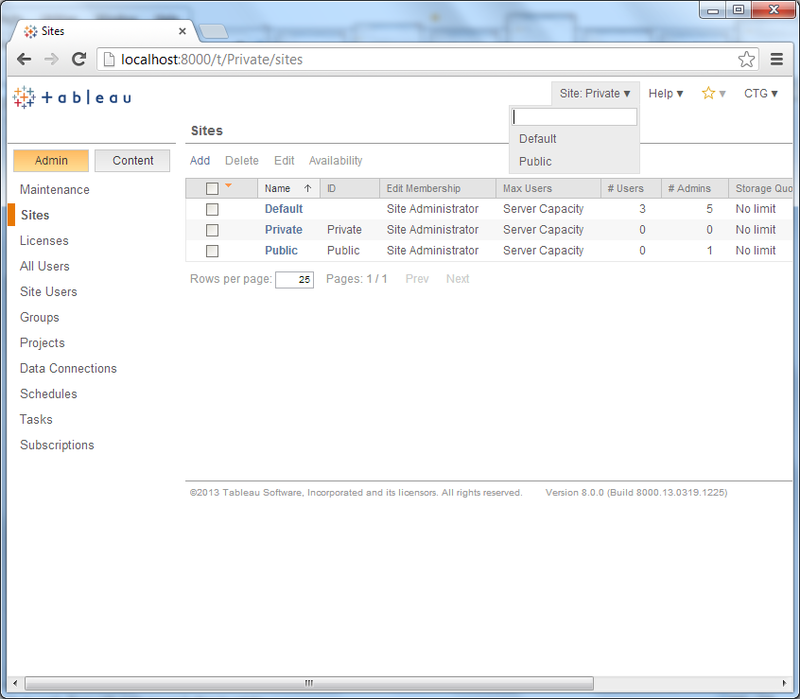 Tableau Server 7's site switching is confusing. When logging in to a Tableau Server installation where he is registered with multiple sites the user chooses the active site from an initial list. Once logged in, switching from the current site to another requires the user to take an indirect route. He can log off and then re-log in, at which point the site selection list will be re-displayed, or he can select "Sites" from the maintenance section—but only if he's a Server Admin (and most users aren't), pick the site to switch to, and then select one of the new site's options. This is tremendously obscure and unintuitive. Even worse, the normal selection mode convention is that when a selection is made from a list it actives the selection in the most obvious context, in Tableau's case selecting a site from the list -should- switch the context to that site, but it doesn't. 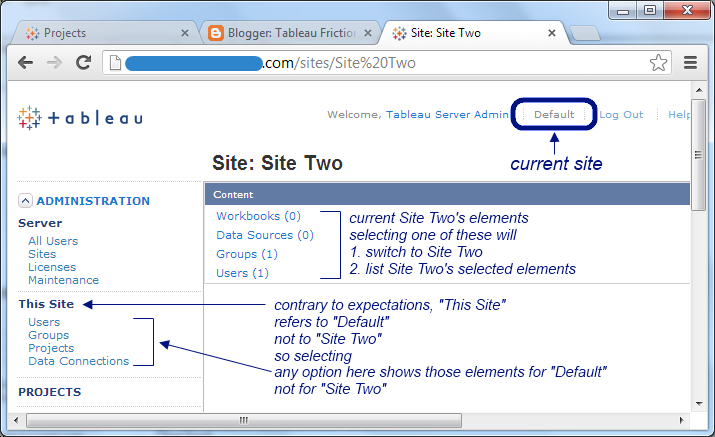 As shown in the screen shots below, switching sites in Tableau 8 is far more obvious and intuitive than in 7. A simple click on the down-glyph next to the current site in the upper right of the page generates a list of the other sites. Selecting one of them immediately switches to it, making it the current site. it presents the list of sites in place, bringing it to the surface so the user doesn't have to go down another path to find it. The placement of the Site: control in the upper right corner is problematic for several reasons. Most importantly it removes the information about the current site away from the information for the other current server elements. At this distance looking for the current site's name requires a substantial visual find-and-read operation. Moving it into proximity to the related context information would reduce this cognitive friction. Speaking of which, as much as the UI has improved, there are still some obvious improvements to be made. Without going into detail here, the current UI doesn't match Tableau Server's structural organization, and it should. Having a presentation model that's different from the structural/organization model is a cognitive mismatch that requires the user to adjust their mental model when aligning them. This makes it harder for the user to accomplish their tasks. More on this is on its way.